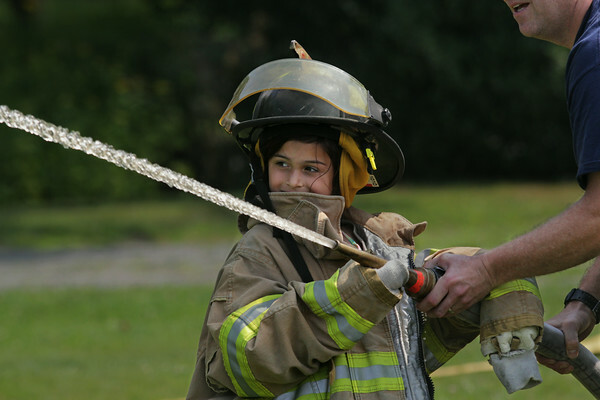 Seven-year-old Lola Fortunado-McElwain wears a firefighter's outfit and tries her hand at spraying water from a fire hose during annual Manchester Summer Playground "Safety Day" in Maconomo Park in Manchester. The Manchester Summer Playground is a drop-in program for children sponsored by the Manchester Parks and Recreation Department. The highlight of Safety Day was when the Manchester Fire Department arrived to demonstrate the fire hoses and spray soap suds and water on the children.